NOVEMBER 1--A woman dressed as a witch robbed a Washington state bank yesterday in a Halloween stickup that ended with her fleeing in a cloud of smoke after a dye pack exploded. 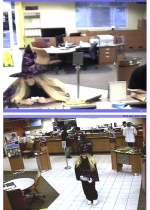 As you can see in these bank surveillance photos, the woman was wearing a pointy purple hat and a flowing blonde wig when she handed a Washington Mutual teller a note demanding cash and claiming she had a weapon. As the woman left the branch, a security dye pack exploded, causing her to drop the dough and her sparkly chapeau as she fled. About 30 minutes after the Lacey, Washington bank was robbed, a second Washington Mutual branch, this one in nearby Olympia, was held up. 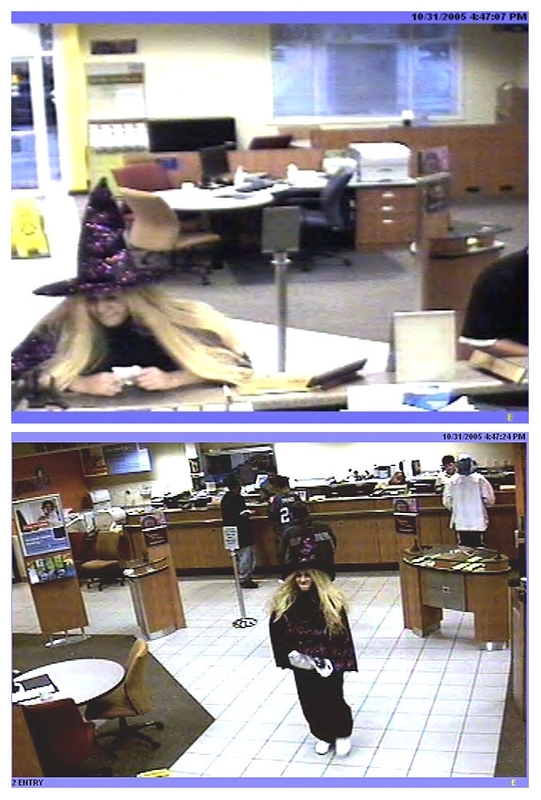 Investigators suspect that the witch, sans costume this time, was behind the follow-up holdup (which was pulled off by a woman wearing a hooded sweatshirt who also handed a threatening note to a teller).